Part 1 was posted over on NonDeScript first, Nathaniel Carroll’s budding blog based in Springfield (like me!). I suggest that you click on over there first to prime the conversational pump for this seemingly simple discussion. Below is my reflection. How do we relate to it? How does it relate to us? The Internet is a function of art and life times expression. Am I starting to bore you yet? Maths and art? There will be graphs soon, I promise. Expression can give either negative or positive effect upon the function as a whole, but in order for the identity to be defined, it is required. The Internet cannot exist without “expression” in some form. I won’t even attempt to ask why “we” exist, but I’d like to know how we exist and function in relation to “I”, the internet. If “P” stands for people, then people are a function of their experiences and other people. So, if we examine a person or a group of people’s experiences, then it goes without saying that people besides the said person or group will have an influence upon him or her (notwithstanding the desert island scenario). As the above graph illustrates, the functions I and P are integrated, highlighting the importance and interrelatedness of the identities. Ok, so maybe it’s just a nonsense graph I drew on some newspaper, but as Carroll pointed out in his post, the Internet is inextricably connected to our lives today. Maybe I’ll follow this mathematical tangent a while longer (oh, the puns, they hurt me). If you’ve ever been in the 4th grade, then there’s a good chance that your teacher read to you, as mine did to me, Madeline L’Enengle’s masterpiece A Wrinkle In Time. If not, head to your local library, check it out, and spend a few hours in a coffee shop alone with it. A “tesseract” is what the characters in the book use to travel through dimensions and time. In math a tesseract is, basically, a cube inside another cube that is also connected. It is a shape that represents another direction, another dimension of existence. That sounds very philosophical, but it just means lines that extend from the same points into different places. Before I continue–rather, before I can continue letting you suffer through this math read, I need to make a qualification. Ok, thanks. Now I’ll go on. So if the Internet (which I have to keep reminding myself is a capitalized proper noun) is a function connected to people, then it is like a tesseract; the Internet is a cube inside of another cube that is not floating, but is connected. Here’s where things get interesting. You can tell from the picture below that this tesseract shape is fairly easy to conceive. It kinda looks like a sugar cube or, if you’re a chemist, maybe some compound’s crystalline structure. With the exception of all the little greek symbols which I know nothing about, the sape is not a strange escher-esque, floating, mobiüs strip type thing. It’s just a cube inside another cube. Maybe the internet is like this…Maybe the cyberworld, which obviously exists within the human world is just a reflection of the human world. Math people, you know what’s coming most likely, but regular folks (myself included) prepare to change your pants. how does it do that?!!? Which cube is which? What is the cyber world and what is human? Is the Governor of California going to come out of this cube like a Magic Eye picture if I stare too long?! The tesseract changes when it is rotated; both cubes stay completely intact, but their positions become interchageable. This is the conclusion that I draw about the relationship of people to the Internet; they are reflexive of one another. They are coefficients of the same variable. Way to the Heart Through the Clover? So I finally subscribed to Wired in an effort to compete with all the junk mail that counts for clutter rather than suitable coffee table fare. I mostly read their stuff online which is identical to the printed version, but I figure that I can contribute just a few dollars to the dying world of print media. I figure they will at least eventually find a home in the basket by my couch that’s currently filled with English journals I never made it around to reading and my wife’s copies of Dance Teacher (which I’ve long since read). On to the point Steve, COFFEE. Wired did an article on the perhaps-as-doomed-as-printed-media Seattle giant Starbucks’s latest comeback effort. Posted under “The Coffee Fix,” the article is curiously titled “Can the $11, 000 Clover Machine Save Starbucks?” Given the current economic situation, most American’s are cutting back on $6 latte drinks and switching to straight cocaine caffeine. Starbucks is now on a soul-search leading back to its roots in the art of brewing coffee as opposed to selling overpriced knick-knacy crap and heart-devouring breakfast sandwiches. 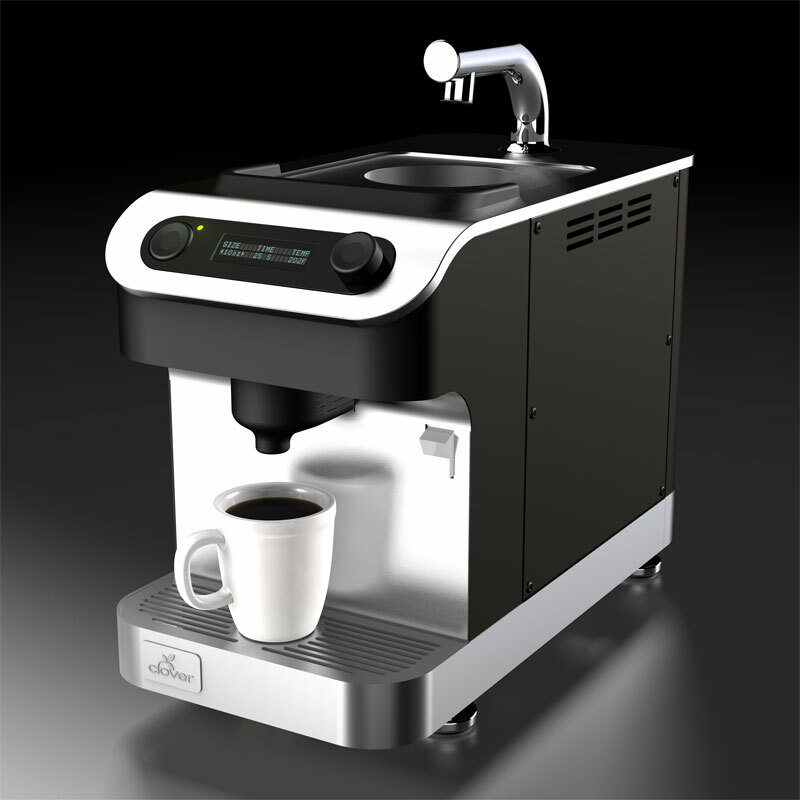 Clover looks like just another countertop coffee machine. But peek under the hood and you’ll find an innovative brewing system. Here’s how it works: 1. A barista selects dose, water temperature, and steep time. 2. 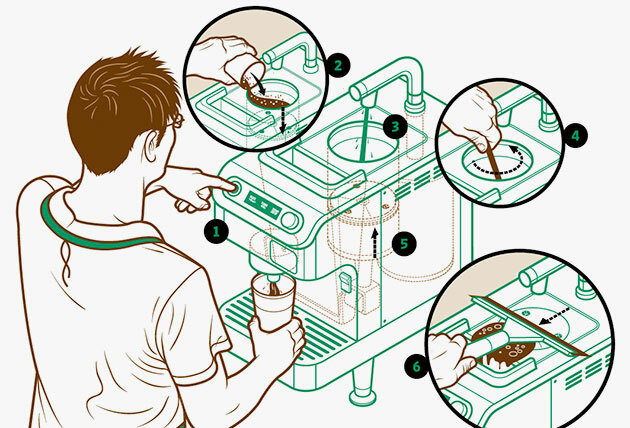 A piston pulls down the filter platform while freshly ground coffee is poured into the chamber. 3. Hot water flows into the chamber. 4. The barista briskly stirs the grounds with a whisk, and the water and beans steep for several seconds. 5.The piston rises, creating a vacuum that separates the brew from the grounds, then lowers, forcing the joe out of a nozzle below. 6. The piston rises to the surface again, pushing up a disc of grounds, which are squeegeed away. All-in-all, I have to say that a cup of Clover made coffee is better than any I’ve ever had. The Coffee Ethic is one of only a handful to get a Clover before Starbucks snapped the company up in what some might say an anti-competitive fashion. I can’t decide how I feel about all this yet, part of me is singing the evil corporation waltz in my head, but another more optimistic part of me says that Starbucks is doing a good thing by putting these changes into place. They do want to continue making money after all, and brewing better coffee is a good place to start.